In the year that has passed since former San Francisco 49ers quarterback Colin Kaepernick ignited the #TakeAKnee movement, we have seen a continuum of responses including calls for incremental change at the NFL. Among the most controversial of these responses is that of black rapper Travis Scott whose decision to perform at the Super Bowl Halftime Show has been met with intense criticism. On January 13th, it was announced that Maroon 5 would star in the Halftime Show and that black artists Scott and Big Boi would accompany them. Scott ultimately agreed to perform on the grounds that the NFL join him in donating $500,000 to the Dream Corps, a social justice organization led by Van Jones. In the wake of Kaepernick’s dismissal from the 49ers and subsequent blacklisting by the NFL, Scott’s suggestion that an act of charity may settle the score has received immense backlash. Meanwhile, Scott insists that his performance represents an opportunity to strong-arm the NFL into promoting social justice, perhaps imagining that if he declined the gig, they would simply approach another artist and not donate. Regardless of his true motivations, Scott’s justification comes after countless artists declined to perform, thus setting the stage for a boycott that was effectively halted by the trio of artists. After launching a viral petition in November urging Maroon 5 to pull out of the Super Bowl, petition author Vic Oyedeji recently launched a new petition calling for the now-confirmed Halftime Show performers to kneel during their sets in solidarity with Kaepernick. For Oyedeji, the NFL’s agreement to engage in charity is insufficient to redress their failings with Kaepernick and the punitive policies that remain on their books. 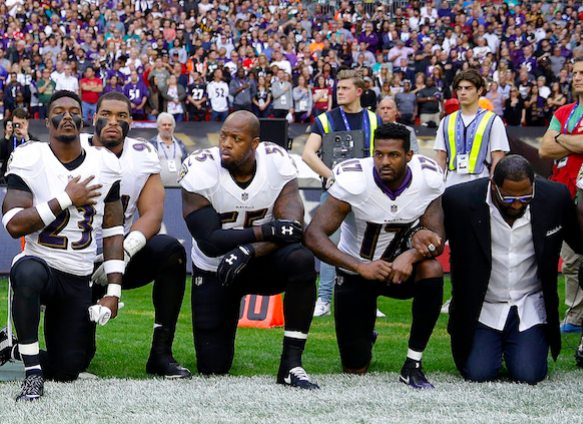 Oyedeji hopes that performers kneeling during the show might urge NFL executives to reconsider policies that punish teams for retaining activist players. As #TakeAKnee illustrates, those pushing for social change must be prepared to engage with well-meaning people who assert divergent theories of change and adjust their strategies in response to changing circumstances. This situation also reveals the vital importance of ongoing critical reflection about the assumptions framing our own acts of upstandership. How do you talk to students about being active participants in a democracy and pushing for change? What does it mean to be an upstander in the face of large institutions over which we may have little or no control? Use our lesson, "Understanding #TakeAKnee” to engage your students in an analysis of historical and contemporary examples of active participation and to consider their own strategies for participating in society.